Pinpointing how multi-product firms organise their operations is key for understanding the drivers of global competitiveness. This column presents a theory on the behaviour of multi-product firms when cost and quality competitiveness jointly determine export performance. Using Chinese data, it finds that firms’ production and sales activity across products and markets is governed by a product hierarchy based on quality. This phenomenon also determines how firms respond to economic shocks. While international trade generates aggregate welfare gains, its distributional effects across firms and households have taken centre stage in recent policy debates worldwide. In developed countries, concerns about competition from low-cost economies have affected key political outcomes such as the latest presidential elections in France and the US and the 2016 referendum in the UK. Notably, the ECB set up a dedicated Competitiveness Research Network in 2012. In developing countries, export promotion continues to be viewed as a means to economic growth, but the high-quality standards of rich consumers in developed export markets increasingly draw policymakers’ attention beyond cost efficiency to quality capability in production (Sutton 2012). In addition to efficiency and quality, how firms organise operations across multiple product lines is also key to global competitiveness. At the micro level, bigger and more productive firms sell more products, with most of their sales, exports and profits coming from a few core goods. Moreover, reallocations across products improve firm productivity and performance in response to shocks such as trade reforms (Bernard et al. 2010, 2011). At the macro level, multi-product firms capture an overwhelming share of production, trade and employment. Reallocations across firms shape aggregate productivity, the gains from trade, and the aggregate impact of firm-specific and systemic shocks (Melitz and Redding 2015). To shed light on these questions, in recent work we examine the global operations of multi-product firms when cost and quality competitiveness jointly determine export performance (Manova and Yu 2016). We present a flexible heterogeneous-firm trade model, and contrast environments with limited versus strong scope for quality differentiation. Using detailed customs data for China during 2002-2006, we empirically establish support for strong quality differentiation. Firms’ production and sales activity across products and markets is governed by a product hierarchy based on quality. This hierarchy also determines how firms respond to economic shocks. 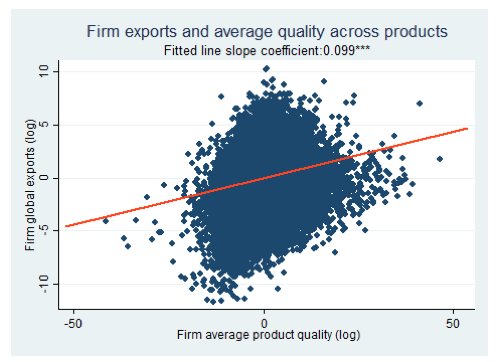 Quality differentiation across firms and across products within firms is thus key to understanding export performance and the effects of trade reforms across the firm size distribution. Within a given product category, more successful exporters have been shown to sell higher-quality goods at higher prices, while also strategically varying product quality across destinations in response to market size, income and competitiveness (Manova and Zhang 2012). We shift focus to multi-product firms motivated by prima facie evidence that quality differentiation across products within firms also matters. 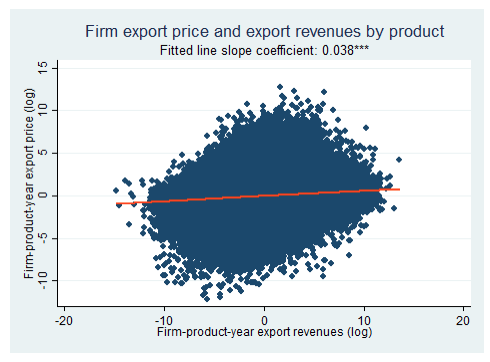 Firms that sell products at higher average prices and firms that vary prices more across their product range attain higher exports and faster export growth. 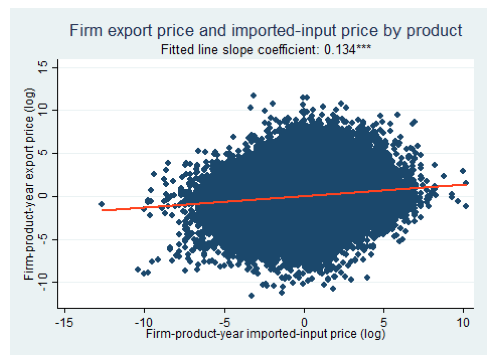 Although output prices may not directly reflect product quality, we document similar patterns when we proxy output quality either with a model-consistent measure based on export price and quantity or with the price or inferred quality of imported inputs (Figure 1). In addition, firms with higher productivity, employment, skill, capital, advertising, and R&D intensity have higher average prices and quality, as well as greater price and quality dispersion across products. Notes: The analysis controls for firm location (Chinese province) and ownership type (state owned, private domestic, foreign owned). The data cover 2002. In our flexible model, firms draw firm-wide ability and firm-product-specific expertise levels which create exogenous variation in production efficiency across firms and across products within firms. If there is scope for quality differentiation (i.e. ‘quality sorting’), firms can choose to make products of higher quality at a higher marginal cost by assembling more expensive inputs of higher quality. The exogenous variation in production efficiency then induces endogenous variation in quality across firms and products, as well as in product scope and sales profile across firms. More able companies offer higher quality of any given good, sell more goods, enter more markets, and earn higher revenues. Within a firm, more expensive varieties of higher quality penetrate more markets and generate higher sales. Firms vary their product scope across heterogeneous markets, and expand their product range by progressively adding goods in decreasing order of price and quality. In contrast, when there is no quality differentiation (i.e. ‘efficiency sorting’), higher productivity is associated with lower marginal costs, lower prices, and higher sales. Firms then follow product hierarchies based entirely on efficiency, and all predictions for input and output prices are reversed. Our rigorous empirical analysis reveals four patterns consistent with multi-product firms participating in the global economy in line with quality sorting. Fact 1. Multi-product firms vary output quality across their product range by using inputs of varying quality. Although quality cannot be directly observed, theory delivers clear predictions for prices and a summary statistic for quality based on observed prices and quantities (Khandelwal 2010). In the absence of detailed information on domestic inputs, we use input-output tables for China to allocate firms’ multiple imported inputs to their multiple outputs (Kugler and Verhoogen 2009, Manova and Zhang 2012). Consistent with quality differentiation, input and output prices are positively correlated across products within a firm, even controlling for firms’ market power in price setting with their market share. The same holds for inferred input and output quality (Figure 2). Notes: The analysis controls for firm-year fixed effects. The data cover 2002-2006. Fact 2: Multi-product firms have core competence in varieties of superior quality that command high prices yet generate high sales. The price-sales profile of multi-product firms displays distinctive features of quality sorting. 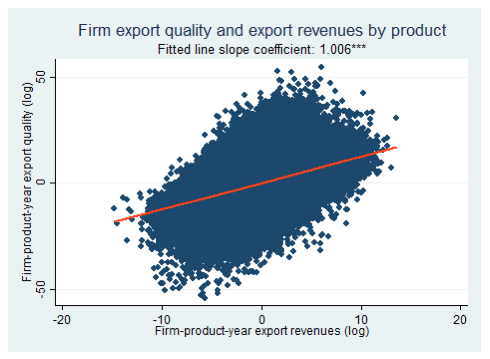 Export prices and inferred export quality are positively correlated with worldwide export revenues across products within a firm (Figure 3), as well as with bilateral sales across products within firm-destinations. These results are once again robust to conditioning on firms’ market power and stronger for differentiated goods and for advertising- and R&D-intensive industries with greater scope for quality upgrading. Fact 3: Multi-product firms increase exports by widening their product scope and by expanding activity away from their core competence along their product-quality ladder. 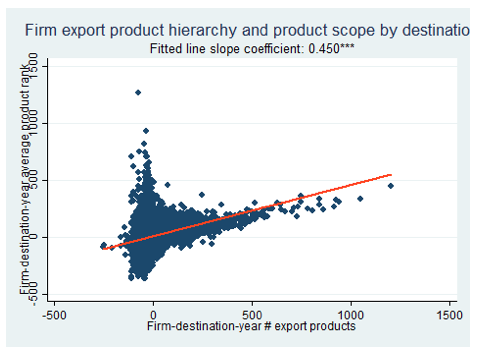 Evidence indicates that firms’ export product scope and export scale are directly linked by a product hierarchy based on quality. We rank each firm’s products three times based on its sales, price, or inferred quality. 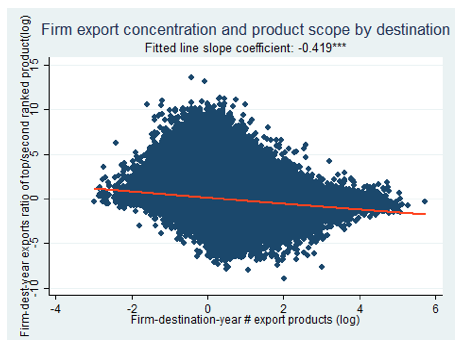 We find that across export destinations within a firm, firms concentrate on their core competences in markets where they offer fewer products and earn lower revenues. On the extensive margin, they drop cheaper, lower-quality goods that place lower in their product ladder. On the intensive margin, they skew sales towards their best-selling, most expensive and highest-quality products. 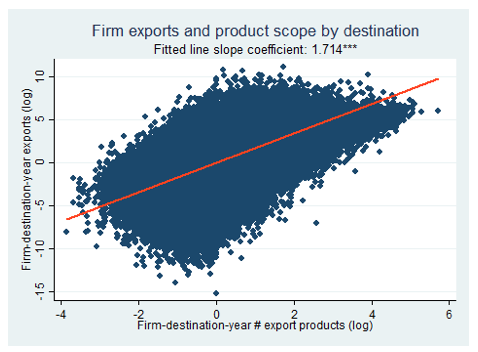 Fact 4: Multi-product firms’ export dynamics exhibit systematic reallocations of activity along the product-quality ladder. Quality sorting also governs multi-product firms’ response to changes in economic conditions over time. We study the overall export dynamics of all firms surviving in our panel, as well as the response of surviving exporters in the textiles and apparel industry to an exogenous trade shock – the removal of export quotas under the Multi-fibre Agreement in 2005. 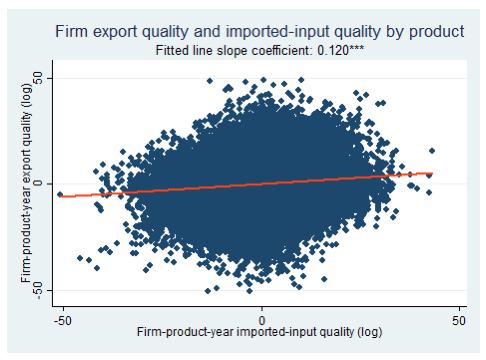 Both exercises reveal that firms expand (contract) their product scope and exports by adding (dropping) lower-ranked varieties along the quality ladder and by reducing (increasing) the concentration of sales in top-ranked products. Our novel insights enrich our understanding of how multi-product firms participate in the global economy when both cost and quality competitiveness influence consumer behaviour and firm performance. This sheds light on the economic impact of globalisation and optimal policy design. First, we know that reallocations across firms and across products within firms mediate trade-induced gains in aggregate and firm productivity, respectively (Mayer et al. 2016, Melitz and Redding 2015). However, financial and labour market frictions distort trade activity and hinder these reallocations (Helpman et al. 2010, Manova 2013). Separately, more successful exporters hire more skilled workers and pay higher wages, while sophisticated inputs and skilled labour are complementary in the production of output quality (Verhoogen 2008). 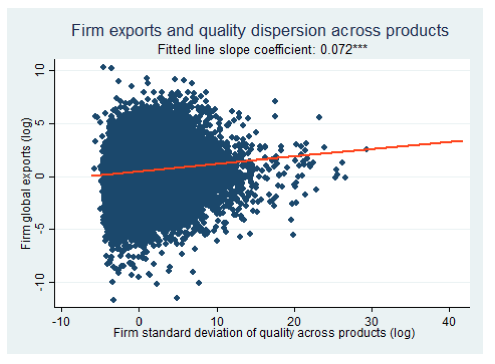 In light of this, our results suggest that quality-driven reallocations across products within firms are a key mechanism through which trade liberalisation affects firm performance and aggregate welfare, as well as inequality along the firm size and worker skill distributions. Second, our findings imply large variation in marginal costs, quality, mark-ups and prices across firms and across products within firms, which complicates the measurement of firm productivity from observable data (De Loecker and Warzynski 2012, Eckel et al. 2015). Accounting for quality and mark-up variation is thus of first-order importance for a wide range of micro and macro analyses that rely on price data or require precise productivity estimates. This includes evaluating the price and productivity impact of trade reforms, the design and implementation of anti-dumping and competition policies, and the pass-through of exchange rate fluctuations to producer and consumer prices. Last, we inform export promotion strategies in developing countries as a means to economic growth. While policymakers often prioritise cost competitiveness, our analysis indicates that quality upgrading is key to export success. This justifies policies that encourage investment not only in production efficiency, but also in quality capabilities. It also highlights the role of import liberalisation – access to a wider variety of inputs and to foreign inputs of superior quality compared to those which are available domestically enables firms to expand product scope, productivity and quality (Amiti and Konings 2007, Goldberg et al. 2010). Equally important is access to skilled labour and effective management practices (Bloom et al. 2016). Amiti, M and J Konings (2007), “Trade liberalization, intermediate inputs, and productivity: Evidence from Indonesia”, American Economic Review 97(5): 1611-38. Bernard, A, S Redding and P Schott (2010), “Multiple-product firms and product switching”, American Economic Review 100(1): 70-97. Bernard, A, S Redding and P Schott (2011), “Multi-product firms and trade liberalization”, Quarterly Journal of Economics 126(3): 1271-318. Bloom, N, K Manova, J Van Reenen, S Sun and Z Yu (2016), “Managing trade: Evidence from China and the US”, Stanford University mimeo. De Loecker, J and F Warzynski (2012), “Mark-ups and firm-level export status”, American Economic Review 102(6): 2437-71. Eckel, C, L Iacovone, P Neary and B Javorcik (2015), “Multi-product firms at home and away: Cost- versus quality-based competence”, Journal of International Economics 95: 216-32. Goldberg, P, A Khandelwal, N Pavcnik and P Topalova (2010), “Imported intermediate inputs and domestic product growth: Evidence from India”, Quarterly Journal of Economics 125(4): 1727-67. Helpman, E, O Itskhoki and S Redding (2010), “Inequality and unemployment in a global economy”, Econometrica 78(4): 1239-83. Khandelwal, A (2010), “The long and short (of) quality ladders”, Review of Economic Studies 77(4): 1450-76. Kugler, M and E Verhoogen (2009), “Plants and imported inputs: New facts and an interpretation”, American Economic Review Papers and Proceedings 99(2): 501-7. Manova, K (2013), “Credit constraints, heterogeneous firms, and international trade”, Review of Economic Studies 80: 711-744. Manova, K and Z Zhang (2012), “Export prices across firms and export destinations”, Quarterly Journal of Economics 127: 379-436. Manova, K and Z Yu (2016), “Multi-product firms and product quality”, Journal of International Economics (forthcoming), NBER Working Paper 18637. Mayer, T, M Melitz and G Ottaviano (2016), “Product mix and firm productivity responses to trade competition”, Harvard University mimeo. Melitz, M and S Redding (2015), “New trade models, new welfare implications”, American Economic Review 105(3): 1105-46. Sutton, J (2012), Competing in capabilities: The globalization process, Oxford: Oxford University Press. Verhoogen, E (2008), “Trade, quality upgrading and wage inequality in the Mexican manufacturing sector”, Quarterly Journal of Economics 123(2): 489-530.